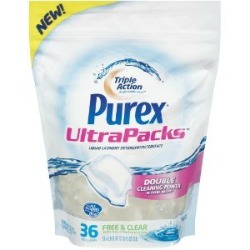 I recently finished a bag of 26 Purex Ultra Packs, in the free and clear scent. Overall, I really liked these packs. They cleaned well, just like when I used Purex free and clear liquid detergent (click the link to read my review of that product). They also dissolved well, although I will tell you that I always started by wash with hot water, threw in the pack, let it dissolve thoroughly, and then turned the water temperature down to warm if I did not wish to wash those particular clothes in hot. Doing it in this fashion meant running about 30 seconds of hot water, which is well worth it in my opinion to make sure the detergent pac actually dissolves properly. Supposedly they should dissolve even with cooler water temperatures, but I just didn't want to take a chance. As with all of these single use, pre-measured pacs, they cost more for each load of detergent than just buying the liquid and measuring yourself. I am not sure the convenience was enough for me to pay the extra price personally, although I could see how some people would think it was worth the extra cost. I did not have any trouble with these packs bursting, nor sticking together. 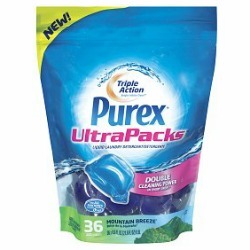 Although I am a Purex Insider I purchased this product myself for testing. It was very difficult for me to find this product in the free and clear scent in a store. I always saw them available in the scented Mountain Breeze scent (the blue colored version), but I finally found the scent free version at Kroger, I believe. I would love to hear from even more people who have used this product, telling me what you thought of it, either positive or negative. 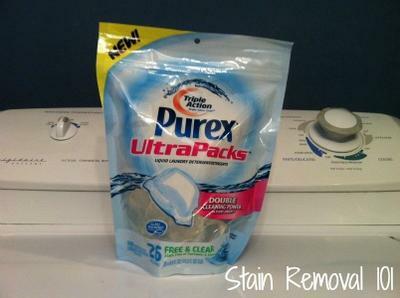 You can share your Purex detergent reviews here, or read others that have already been submitted. Further, you can compare various types of laundry detergent pacs here. I have been using the Free & Clear pacs for a couple years because I seem to react to most other detergents. Everything was fine until a couple months ago when they changed something in them. They are now an orangeish colour instead of mostly clear. Noticed the change and didn't think much of it until the itching started again. Sorry to hear that Heather. That's interesting though that they changed color, because I've gotten many reports lately that the free and clear All detergent pacs have also changed color, in their case, they look more yellow now. Those two detergents are not made by the same company, so it could be pure coincidence, but it seems odd. Anyone else notice a change in color of these pacs, and also has the change caused any type of rash or hive reactions for you as they did Heather? I noticed after washing and drying a set of sheets that the pack had adhered to the sheet. Apparently it had not dissolved completely. I had used warm water also. Fortunately, after soaking in the sink and rewashing the sheets the stain and residue was gone. Sorry you had trouble with these laundry detergent pacs Lisa. As I explained in my review above, I did not have an issue with this, but I also used hot water to dissolve the pac completely before adding any clothing into the machine. I know that can be a more drawn out process, but so is soaking and rewashing clothing because the packet has not dissolved completely. I guess we all just have to decide if this issue is worth the convenience of the single use packs or not. I would love to hear from more people who've used this product sharing your experiences and opinions of it, and also whether you've had any trouble with them dissolving like Lisa did. 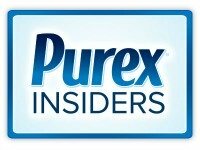 You can share your Purex detergent reviews and experiences here, or read lots of others, for a variety of these products, at the link that have already been submitted.